Salivary gland malignancies, being relatively rare, comprise of <5% of all head and neck tumors. Acinic cell carcinoma is a low-grade malignancy which accounts for 17% of the malignant salivary gland tumors. However, these tumors have been observed to present with late recurrences and distant metastasis even after adequate treatment of the primary. A low mitotic rate of these tumors makes it relatively resistant to chemotherapy. We, therefore, present this case of an 18-year-old girl with acinic cell carcinoma (ACC) who came with local recurrence and distant metastasis after 15 years. The authors are reporting this case to highlight the pattern of relapse and the ability to achieve stable response of this histology to chemotherapy. A 33-year-old female patient presented to our hospital with a history of recurrent swelling below her left ear lobe. She had been previously diagnosed as an acinic cell tumor of the left parotid gland in 2002 and had been operated at that time. She had also been advised adjuvant radiotherapy but had not taken the treatment. She then had her first local recurrence in 2005 (confirmed histopathologically as acinic cell tumor) and underwent wide local excision with negative margins. She then received 50 Gy in 25 fractions of adjuvant radiotherapy at another hospital. She remained asymptomatic for 12 years, after which she again noticed a painless swelling at the same site, which progressively increased in size and was associated with deviation of face to the right side. She reported to the Department of Otorhinolaryngology in 2017 at our hospital where on examination, a 2 cm × 3 cm solitary, hard, fixed swelling was palpated on the left side of the face just inferior to the ear lobule along with the presence of features of lower motor neuron palsy of the left facial nerve. A fine needle aspiration cytology was done which confirmed a diagnosis of ACC. 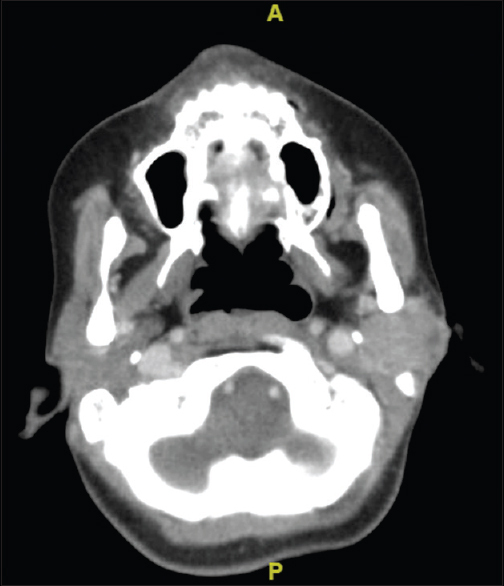 A contrast-enhanced computerized tomographic (CT) scan of the head and neck was done which revealed a 2.82 cm × 2.78 cm heterogeneous, mixed density lesion involving left parotid region with engulfment of the stylomastoid foramen and enlarged lymph nodes in the left Level Ib and Level II with the largest measuring 1.2 cm × 1 cm [Figure 1]. Incidentally, the thoracic cuts of the CT scan revealed multiple nodular opacities in the lung parenchyma, suggestive of metastasis [Figure 2]. 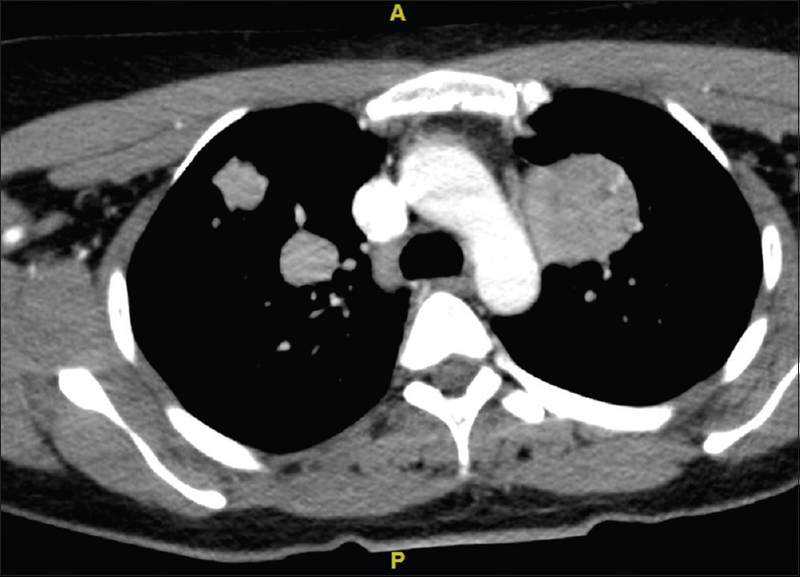 A CT-guided biopsy from the lung lesion was done to differentiate a metastatic lesion from a second primary. Histopathologic examination with immunohistochemical (IHC) markers was suggestive of ACC; IHC negative for thyroid transcription factor-1, P63, CK7, and CK20; and periodic acid–Schiff stain was positive and diastase sensitive [Figure 3]. After a multidisciplinary tumor board discussion, the patient was planned for palliative chemotherapy. She was given a triple agent regimen of cyclophosphamide 500 mg/m 2, doxorubicin (adriamycin) 50 mg/m 2, and cisplatin 50 mg/m 2 with primary granulocyte colony stimulating factor prophylaxis. Response assessment contrast-enhanced CT after three cycles revealed stable disease at the metastatic and primary sites while the nodes had resolved. The patient was subjectively asymptomatic. In view of the paucity of evidence supporting any other chemotherapy and subjective clinical response, it was decided to continue the same CAP regimen for three more cycles. Imaging after six cycles did not show any further response compared to the interim CT scan. In view of stable disease and the patient being relatively asymptomatic except for the established facial palsy, it was decided to keep her under close follow-up and to intervene at the time of any radiological or clinical progression. The patient is currently on regular three monthly follow-up and continues to be with stable disease at nine months post chemotherapy. Malignant salivary gland tumors have been broadly classified into high grade and low grade by World Health Organization. High-grade tumors include adenoid cystic carcinoma, adenocarcinoma not otherwise specified, carcinoma ex pleomorphic adenoma, and other less common variants such as squamous cell carcinoma and salivary duct carcinoma. ACC, which belongs to the low-grade variant, is known to be a very slow-growing tumor and accounts for 7%–17% of salivary gland malignancies. The local recurrence rates are around 20%, while 10% of these patients may develop metastatic disease., Women in their fourth decades are the most common presenters, with male to female ratio being 3:2. About 16% of these patients have been found to be under the age of 30 years; our patient too was under 30 years at the time of presentation. ACC is amenable to surgical resection with or without adjuvant radiotherapy and have favorable outcomes. Unresectable lesions may occasionally respond to chemoradiation either in concurrent or sequential manner  although ACC is known for its relative radioresistance. With insufficient number of cases available across the globe, we lack Phase III evidence for the management of metastatic ACC. Palliative chemotherapy is the current practice, extrapolating from other metastatic head and neck malignancies. If feasible, locoregional treatment with metastasectomy may be offered for patients with good performance status considering the indolent nature of this histology. However, the current patient was not a candidate for metastasectomy in view of bilateral multiple large parenchymal lung metastases. Owing to the paucity of Level III evidence, data from Phase II studies and retrospective reports were used. Polychemotherapy has provided better response rates than monotherapy. Studies have shown the best possible overall response rate of 46% with a triple chemotherapy regimen of cyclophosphamide, adriamycin, and cisplatin administered every 28 days, with primary or secondary colony-stimulating factor support., The Phase II study by Licitra et al. had 6 out of 22 patients (27%) achieving a partial response. Our patient could achieve stable disease post-6 cycles of triple agent chemotherapy and continues to remain asymptomatic at 9 months. The predominant young age of presentation and a long period of posttreatment survival make it essential to identify the appropriate chemotherapy to tackle this indolent slow-growing tumor, which in turn mandates further clinical studies. Laurie SA, Licitra L. Systemic therapy in the palliative management of advanced salivary gland cancers. J Clin Oncol 2006;24:2673-8. Al-Zaher N, Obeid A, Al-Salam S, Al-Kayyali BS. Acinic cell carcinoma of the salivary glands: A literature review. Hematol Oncol Stem Cell Ther 2009;2:259-64. Eveson JW, Auclair P, Gnepp DR, El-Naggar AK. Tumours of the salivary glands. In: Barnes L, Eveson JW, Reichart P, Sidransky D. editors. World Health Organization Classification of Tumours. Pathology and Genetics of Head and Neck Tumours. Ch 5. Lyon, France: IARC Press; 2005. p. 221-2. Omlie JE, Koutlas IG. Acinic cell carcinoma of minor salivary glands: A clinicopathologic study of 21 cases. J Oral Maxillofac Surg 2010;68:2053-7. Patel NR, Sanghvi S, Khan MN, Husain Q, Baredes S, Eloy JA, et al. Demographic trends and disease-specific survival in salivary acinic cell carcinoma: An analysis of 1129 cases. Laryngoscope 2014;124:172-8. Hoffman HT, Karnell LH, Robinson RA, Pinkston JA, Menck HR. National cancer data base report on cancer of the head and neck: Acinic cell carcinoma. Head Neck 1999;21:297-309. Mukherji A, Verma P, Sinha D, Gulati A. Case report: Rare case of acinar cell tumour of parotid responsive to chemo-radiation. Indian J Otolaryngol Head Neck Surg 2010;62:1-4. Lagha A, Chraiet N, Ayadi M, Krimi S, Allani B, Rifi H, et al. Systemic therapy in the management of metastatic or advanced salivary gland cancers. Head Neck Oncol 2012;4:19. Debaere D, Vander Poorten V, Nuyts S, Hauben E, Schoenaers J, Schöffski P, et al. Cyclophosphamide, doxorubicin, and cisplatin in advanced salivary gland cancer. B-ENT 2011;7:1-6. Licitra L, Cavina R, Grandi C, Palma SD, Guzzo M, Demicheli R, et al. Cisplatin, doxorubicin and cyclophosphamide in advanced salivary gland carcinoma. A phase II trial of 22 patients. Ann Oncol 1996;7:640-2.